Like most things in Photoshop, there are many ways to sharpen images. There are lots of tutorials and online videos showing the different methods, and plenty of opinions about what works best. While I am certainly no expert in image sharpening, I still need a practical sharpening method in order to present my images to others. And, because I’m no expert on image sharpening, I also want a method that is simple to use and works on every image. That’s what I’m going to try and discuss here—my personal approach to sharpening images. It is simply this: USE A LUMINOSITY MASK. Yes, I know about the multitude of sliders and different color modes, blending modes, and edge masks for sharpening (and understand most of it), but gave it awhile back for something more automatic and less complicated. Pretty much a no-frills, one-size-fits-all method to image sharpening that provides consistently good results. The second concept that is important to sharpening with luminosity masks is that both sides of the sharpened edge—the light and the dark side—are not perceived the same. Over-sharpening that shows halos and “crispiness” is almost always the result of the light side of the sharpened edge being too light. When someone mentions they can see halos in a sharpened image, it is always a light halo to which they are referring. Sharpening, however, increases contrast on both sides of the tonal edge. The light tones on one side of the edge get lighter (producing light halos) and the dark tones on the other side get darker (producing dark halos). Light halos are terribly obvious when looking at an image, but the dark halos are essentially invisible. We readily see the light halos and totally ignore the dark ones. So the reason luminosity masks work so well for image sharpening is this: luminosity masks, because they can select specific tones, are able to conceal the light side of the sharpened edge (where obvious haloing and over-sharpening are perceived), while at the same time revealing the dark halo (which is perceived as enhanced sharpness instead of as a halo). Luminosity masks are created from the actual tones in an image so they perfectly reflect the enhanced contrast that sharpening creates at tonal edges. As such, they’re an ideal tool to adjust a sharpened edge to preserve sharpness while at the same time reducing halos. To see the importance of the dark tones to image sharpening, roll over the above image again. Notice how you can see the enhanced sharpness more in the dark tones than in the light tones. It’s subtle, but compare the difference in the change in sharpness from the rollover in the darker ¼ tones with the lighter ¾ tones. It helps illustrate that it’s the dark tones in the image where sharpness is perceived. Luminosity masks that reveal these dark tones, therefore, can do a nice job of maintaining the impression of an appropriately sharpened image even as the light halos and lighter tones are masked. It’s the Darks-series of luminosity mask that conceal light tones and reveal dark tones, so it is these “Darks” masks that will be of value in the image sharpening process. It’s also worth noting that to use luminosity masks successfully for image sharpening, it’s necessary to do the sharpening on a duplicate layer of the flattened image. This is so that when the luminosity mask is employed to mask light halos, the unsharpened, “un-haloed” image pixels can still show through from the layer below. Web presentation provides a good example of the utility of luminosity masks for sharpening. An easy way to sharpen an image for the web is to downsize it in two steps using the Image>Image Size command and to apply the Filter>Sharpen>Sharpen command after each downsizing. For the first downsizing, choose a dimension that is 1.667 times the final desired dimension. If an image will be downsized to a 900-pixel horizontal dimension, for example, choose 1500 (900 x 1.667 = 1500) pixels as the first down-sizing horizontal dimension. After this, run the menu command Filter>Sharpen>Sharpen to do an initial sharpening of the image. Then run Image>Image Size again, this time inserting the desired 900 pixels as the horizontal dimension and afterwards run Filter>Sharpen>Sharpen again. The results will be a predictably too-sharp image. The image below shows what this looks like. If you look closely at the image you’ll see that it’s the light tones that are causing the perceived over-sharpening. While there may not be any obvious halos, there are plenty of “micro-halos” making the image look extremely crisp. Rolling the mouse over this image will show the unsharpened version. As you can see, it’s the light tones that have really popped out in the sharpened version. Smaller rocks and some of the upper diagonal edges have gone almost pure white. The improved sharpness looks good, but the visible white indicates it’s gone too far. The predictable over-sharpening that occurs with this down-sizing method is actually ideal as it allows a predictable solution—a luminosity mask. The goal here would be to hide the excessively white pixels allowing the darker pixels from the layer below to show through, but to still maintain the excellent sense of sharpness that’s needed for good presentation. The Dark Darks mask does this quite well for this image. The image below shows the Dark Darks mask. The roll-over shows the over-sharpened image. 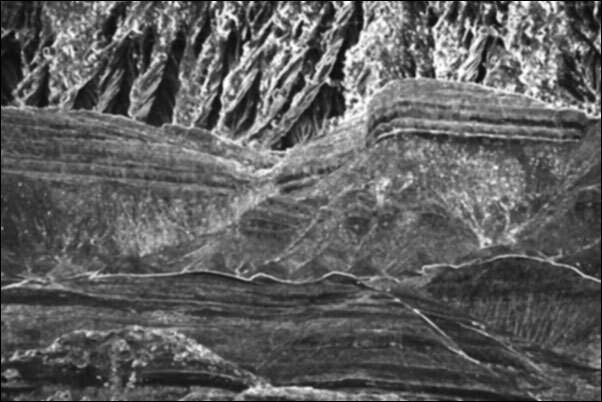 Although it’s a little difficult to see at this size, the darkest areas of the mask correspond to the lightest, whitest areas of the over-sharpened image. When added as a layer mask to the over-sharpened image layer, this Dark Darks mask conceals the light tones (good-bye white pixels) and reveals the sharpened dark tones (so that the image still looks sharp). The image below shows the final sharpened version with Dark Darks mask in place as a layer mask. The excessive sharpening is gone, but the image is still nicely sharp. The rollover shows the over-sharpened version without the mask. Note how the edges that were too bright and overly crisp have been eliminated and how the dark tones still have a sense of sharpness that is not overdone. The Dark Darks mask provides the proper gradation of tones to conceal the over-shapening in the light tones, but to still also reveal the improved sharpness in the dark tones. The layer stack for this sharpening process is shown below. NOTE: My web-sharpening actions make use of a similar down-sizing/sharpening/masking technique, though the mask used is more complex to allow for greater flexibility in adjusting the final sharpness of the image. The “straight” Dark Darks mask was used in this example to illustrate the utility of a Darks-series mask to conceal the light side of over-sharpened edges and how the Darks-series masks can be used in the image sharpening process. Sharpening images for the web using a luminosity mask is quite easy; web images are relatively small, almost always under 1,000 pixels for the longest dimension. Can this method be scaled up for print-size images that may be 5,000 to 10,000 pixels on the long side? The answer is yes, but it’s necessary to be able to predictably sharpen an image (or slightly over-sharpening it would be even better) before adding the luminosity mask. The Filter> Sharpen>Sharpen command isn’t going to work. It’s fine when down-sizing an image for web presentation (72 dpi), but will yield very crude results for a print at 360 dpi. My solution for a long time has been Nik Sharpener Pro. I’m currently using version 3.0, but have been using this program for sharpening since version 1.0. (NOTE: I have no affiliation with the makers of Nik software.) While I don’t have any documentation on this, the software seems to read the unsharpness of the image and then calculate and apply the correct sharpness setting specific to that image. In other words it is very automated and produces predictable results. Within the interface there are a number of sliders and menus for such things as output device, some creative controls, and even local controls, but I don’t use any of them. I simply run the plug-in at the default settings every time, which happens to be for output on a “display,” which I take to be a monitor. And every time I get a slightly over-sharpened image to which I can add a Darks-series luminosity mask to conceal the over-sharpening on the light side of tonal edges and to reveal the sharpening on the dark side of the edge. Using this information, I’ve listed below the steps I follow for sharpening an image to be printed on an inkjet printer. 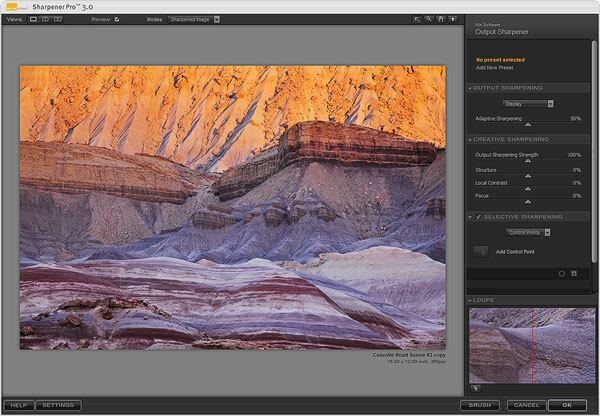 It’s important to start thinking about the sharpening process at RAW conversion. In the RAW convertor (ACR/LR), I drag the “Amount” for the Sharpening slider to zero and also leave the Clarity slider set to zero. In other words, I purposely do not add sharpening as part of RAW conversion. I usually do a lot of processing in Photoshop, and any processing step that increases contrast can also increase apparent sharpness. If too much sharpness is added during RAW conversion then the overall image, or certain parts or tones, may over-sharpen during processing, and it’s hard to remove this over-sharpening when it comes time to do the final sharpening. Purposeful sharpening right before printing is a more controlled way to add the final sharpness. I prefer to use a dedicated sharpening procedure at the end of Photoshop processing instead of adding sharpness during RAW conversion before I even start working on the image. Image development in Photoshop—work in 16-bit and add as many layers and adjustments as necessary. With no sharpening added during RAW conversion there is freedom to do whatever is necessary for the image without being too concerned with its effect on image sharpness. Duplicate and flatten the processed image. Create a duplicate image layer. Remember, sharpening needs to be done on a duplicate layer of the unsharpened image so that the un-haloed edges of the unsharpened image can later be revealed in the sharpened version when the Darks-series luminosity mask is added. Run Nik Sharpener Pro 3.0 RAW Presharpener—this corrects the soft blur inherent with digital capture. NOTE: This Presharpening step is NOT the actual final sharpening step. It does what some references refer to as “capture sharpening,” which is much more subtle than final sharpening. It’s a very necessary step, though, as it allows the final sharpening to be effective. It seems to create the micro-edges (not the micro-halos) that are so necessary for creating great detail and sharpness in the image. There are sliders in this Presharpener dialog box, but , again, I simply accept the defaults here too. The image below shows the Nik Presharpener interface. Create a duplicate image layer of the “RAW Presharpener” layer. Run Nik Sharpener Pro 3.0 Output Sharpener using the default settings. This does the “final” sharpening of the image. The default settings almost always over-sharpen the image as described above. The image below shows the interface for the Nik Output Sharpener. Create the Dark-series of luminosity masks on the Channels panel. Load a Darks-series luminosity mask as a selection by doing a Ctrl+click (Mac: Command+click) on one of the masks on the Channels panel. See the paragraph below for information on which mask to choose. 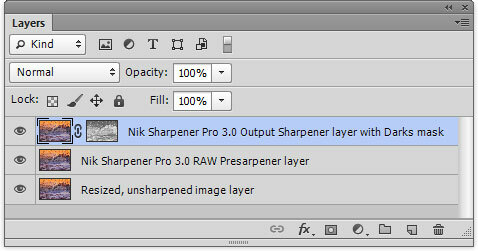 Create a layer mask of the selection on the Output Sharpener layer. Below is how the Layers panel looks after the sharpening sequence is completed. There are a variety of factors that will determine which Dark-series mask works best for this method of sharpening. It’s useful to try all the Darks-series masks, at least initially, to see which does the best job at removing the over-sharpening while also permitting the Output Sharpener layer to add the appropriate amount of sharpness to the image. Trying all the masks also provides a sense for how the different masks affect sharpening and what works best for a particular image size. Masks that include more tones (Darks and Dark Darks) allow more sharpening to be revealed and therefore more apparent sharpness to show in the image. If the image looks too crisp or has halos with one of these masks, try the Shadow Darks or Super Darks instead. Generally, the more an image is enlarged from its capture size the more sharpening it can tolerate. I use a 21-megapixel camera and proof my images at 12×18 inches, 360 pixels per inch on matte paper using an Epson inkjet printer. This output size results in about a 30% increase in the total pixel count from what was captured by the camera. For an image at this resolution with this increase in pixel volume, the Dark Darks mask works close to 80% of the time for properly masking the final Nik Output Sharpener layer. The Darks mask is usually the alternative if the image needs more sharpness. For a 16×24 image from the same camera and at the same resolution, the pixel count is more than doubled from what was captured by the camera. In this case, the Darks masks might work. Another option to consider is an inverted Light Lights mask. Any inverted Lights-series mask becomes a Dark-series mask, and inverted Light Lights reveals more dark tones compared to a Darks masks, so it will reveal more sharpening as well. 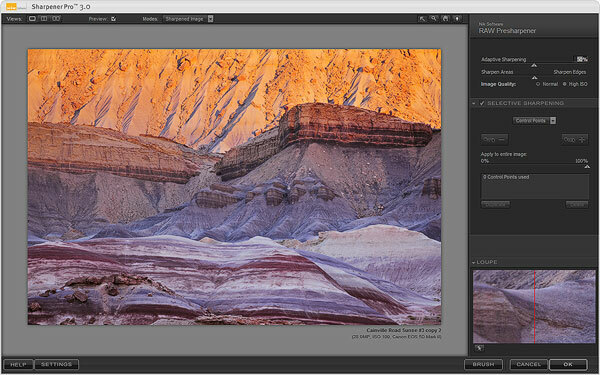 Images downsized from their capture size may only need the RAW Presharpener layer. If additional sharpening is still necessary, the Output Sharpener layer will likely only need a Shadow Darks or even Ultra Darks mask to add a bit of additional sharpening. There are, of course, variations to this procedure. The most obvious is to NOT add any sharpness at all to monochromatic areas of the image, like blue sky. In this case, make a selection of the sky and mask it off on the Presharpener layer and also fill the Dark-series mask with 100% black for the sky selection on the Output Sharpener layer. There may be other variations too. The goal is to respond to what the image needs, but to also keep the actual sharpening procedure as automatic as possible. I don’t use edge masks for overall image sharpening. They’re intended to select the edges in an image and constrain sharpening only to these edges. That’s good in theory, but there are two problems. The first is that they only find the major edges. Finding the smallest edges is also often important in order to reveal micro-details in the print. Sharpening through an edge mask misses some of these finer edges. The second problem is that the edge mask selects both the light and the dark sides of edges. As already discussed, the light side is the problem side. Revealing it excessively leads to over-sharpening and halos. Edge masks don’t discriminate between the light and dark sides of sharpened edges the way luminosity masks can. Sharpening through edge masks can still produces halos, especially for edges that have strong tonal contrast to begin with. The image below shows what an edge mask looks like for the example image used here. Another strategy sometimes employed for dealing with light halos is to change the blending mode of the over-sharpened, halo-containing image layer from Normal to Darker Color. Darker Color blending mode compares pixel tones of the current (sharpened) layer with the pixels in the layer beneath and displays the darker of the two. Light halos are replaced by the darker pixels of the underlying unsharpened image. This technique can work sometimes for images sharpened for the web, but is too strong and lacks important tonal distinction when used for sharpening images for print. The Darker color blending mode completely removes the pixels that were lightened by sharpening and in the process also removes some necessary sharpening. A Darks-series luminosity mask, on the other hand, conceals the light halos, but in a progressive manner. Luminosity masks always have a gradation of pixel tones that make them self-feathering. This gradient of tones preserves the sharpening by still revealing some of the lightening on the light side of the edge, but it removes enough of it so that halos and overly crisp edges disappear. Even more important, in the darker tones, the Dark’s series masks might not remove anything from the light side of the sharpened edge since the contrast increase from sharpening may not have pushed the light side to the threshold that will be concealed by the mask. So in the ¼ tones (that are so effective in the perception of image sharpness) the Darks-series mask reveals all that it can, possibly including both the light and dark sides of the sharpened edge, to maintain the sense of overall image sharpness. Unlike the Darker Color blending mode which blindly selects the darkest tone to reveal, a Darks-series mask can effectively block light halos, reveal a gradation tones to insure sharpness, and maintain full contrast edges in the ¼-tones. This tone-variable affect of the luminosity mask helps to get sharpening right across all tones in the image. Again, I’m not an image sharpening guru and just want a simple, predictable method for sharpening my images. Slightly over-sharpening the image and then adding a Darks-series luminosity mask provides that. It takes a bit to write out the procedure, but in reality it is so automated that it can be done with very little thought. This sharpening method has also helped me understand how we perceive light and dark halos differently in the sharpened image and how emphasizing the dark side relative to the light side of the sharpened edge can be used advantageously. The next installment in this series will look at another technique where choosing the “dark side” can be used to create some useful effects. Lastly, I want to take a moment to mention that Sean Bagshaw has recorded a new series of videos on creating and using luminosity masks. The Complete Guide to Luminosity Masks provides excellent instruction both on how to create the masks and how to apply them as a part of a creative workflow in Photoshop. You may recall that I bought your entire package. I am still reading the PDFs and watching Sean’s videos – both excellent! I’ve read at least a shelf full of books, articles, etc., on post processing and DSLR photography – and another two shelfs full of training videos. Of all that I’ve read and seen, yours and Sean’s work is what I consider “mandatory” for anyone serious about digital photography. (Of course, your methods require foundation knowledge in PS.) When I’ve completed this process, I will write a right proper recommendation. I went to GLJ to find Part 1. I just scanned it. Does Part 2 replace Part 1? Thank you for the positive feedback. Glad to know the luminosity masks have been useful to you. This post is the second in a 3-part series on how luminosity masks can be useful in selecting either the light or dark sides of tonal edges. The first installment was on fixing HDR halos, so it’s a different topic and is not replaced by this post. Very interesting write out Tony, but please help me get a fine point straight: in step 8, are you creating the Dark-series of luminosity masks from the Output Sharpener Layer? By so doing, what’s the point in keeping the original, unsharpened layer around … after all, the masked out pixels in the top layer would come from the Nik Presharpener Layer, not from the unsharpened one. As a side note, I normally do “capture sharpening” using Focus Magic: do you think a similar procedure would work by exchanging the Nik Presharpener with this deconvolution-based tool? Any thoughts on this? True, you could delete the original backgroung resized image layer in this sequence and still obtain the same results with the printer. I’m always hesitant to delete my original starting point, though. While I could generally regenerate this resized background image from the master file quite easily, there are times this background has additional healing/cloning steps and sometimes the original is cropped and resized with the aspect ratio unlocked. So keeping the background, starting-point image intact is always a prudent step if I decide to change the sharpening sequence later. Really don’t know about Focus Magic. If it does similar pre-sharpening like the Nik tool, it should have a similar effect. Should be easy to experiment and see.